Suffice to say that my plans to get several posts written and queued up before we leave on vacation this Sunday never materialized. Close, but no cigar. Living in a hobbling, semi-ambulatory state for the last five days put me in my place more than once, and I found myself thinking, Really? Do I really need to write one more recipe? Or should I focus on getting this knee better so I can actually walk? Of course I need to write. Just one more. The last minute shopping has been done, the house is relatively clean, tickets, shuttles, and reservations are in order. Maps, check. Routes, check. Super-strength enormous bandaids for my feet, check. Nine months of obsessive planning, check. It looks like we’re ready for our trip to the UK. We’ll be in London for four days, then drive through Kent, and East and West Sussex, staying a couple of nights along the way, cutting up toward Oxford and then the countryside near Worcester where we’ll stay three days. The last portion of our stay will see us in York, then Cambridge and Essex before we drive back to Heathrow and our trip home. It promises to be a wild two weeks, and like the last time, I’m sure at least one intelligent Brit will say, “Why are you Americans always in such a hurry? You can’t really see the UK in less than a month.” And we know they’re right, of course, but who can afford it? Who can stay away from work that long? If we had the time and resources, we’d have made it to Cumbria near the Scottish border to enjoy the beautiful Lake District along the way. And we’d definitely would have made time for a drive through Dorset to Dartmoor and Plymouth, where one of my great-grandfathers boarded an old sailing ship to journey through the Straits of Magellan to Sebastapol, California more than a century ago. There will always be another time for Cornwall, with its craggy coastline and Arthurian legends, but I couldn’t wait for that time to try an authentic Cornish Pasty. Is it authentic if it’s made by someone from Southern California who’s had sound Cornish advice? Who cares if they’re as delicious as these. In a large bowl, mix the flour and salt well, then add the shortening and butter by “pinching” it into the flour until the mixture resembles clumpy oatmeal. Add the water and toss with a fork until the mixture is uniformly dampened. Pat the dough into a ball, and turn out onto a lightly floured counter. 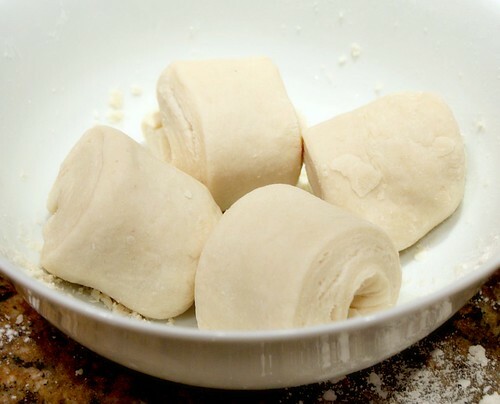 Roll the dough out a bit, turning it occasionally, and folding it over itself to roll again. Don’t fuss over it and worry. 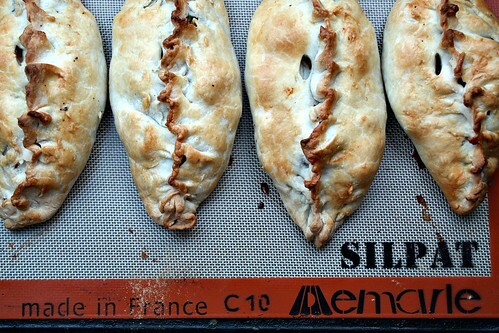 You’re not making puff pastry. 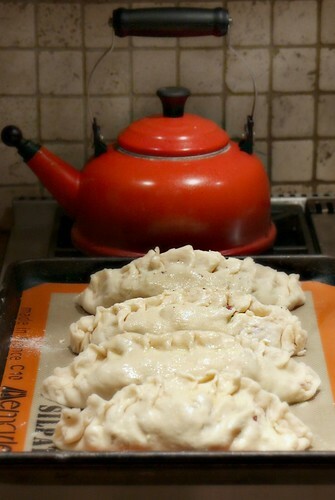 Divide the dough into four pieces and set aside. To make the filling, have the ingredients ready to use. 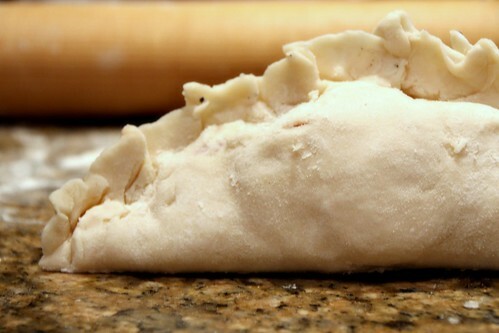 Roll out one piece of dough into a circle about 8″ in diameter. 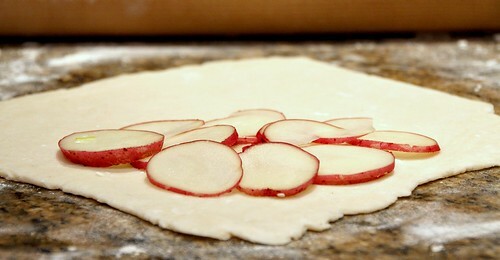 Start with the potatoes and layer a few on one side of the dough as a base. 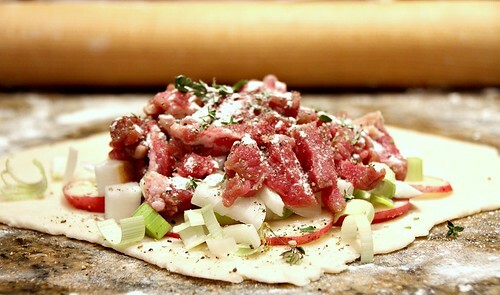 Add the turnip cubes, then the onions, sprinkle the leeks over, then the meat. Sprinkle on some thyme, salt, pepper, and a bit of flour. Add the Stilton last. 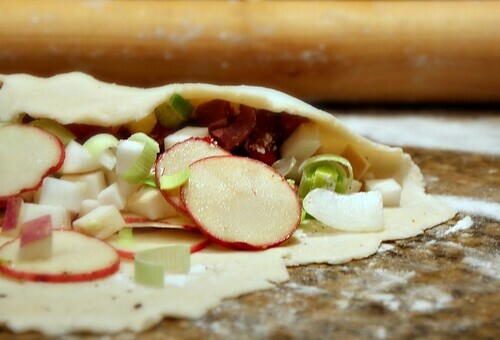 Brush some water around the edges of the dough, then lift one side of the dough over the fillings. Press the edges together, pinching tears if they occur back together. Roll the pastry onto its back so the edges are facing up like a stegosaurus. Sorry. That’s what they remind me of. Crimp the edges together with a bit of a twisting motion as you go from one side to the other. Place the pie onto a baking sheet and brush with the egg wash. Using a knife, make a slit at the top near the edge of the crust for steam. Repeat the process with the remaining three pieces of dough, and bake for about 25 minutes, or until the heavenly aroma permeates your entire house, and the crusts are golden brown. 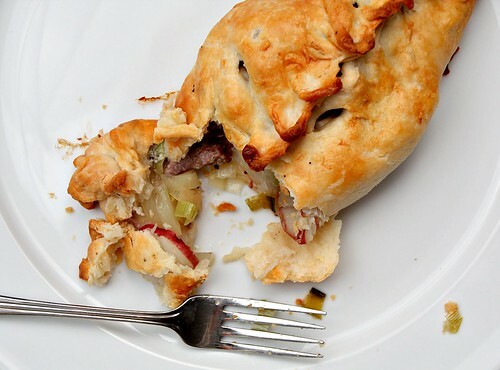 Many thanks to Joe’s Pastry for his great posts on Cornish Pasties. Thanks as well to the lovely people who posted this video of their Cornish grandmother making pasties. Here’s a version that shows the filling layering. So helpful! If you have dough phobia, this is the dough for you. It’s a breeze. No chilling, no food processor, or anything. It’s so easy to make and truly is something you can start an hour before you want to eat. I used a small amount of beef in these and it was the perfect amount. Work to get those pieces small and they’ll cook nicely. There was not one single leak from any of my pasties. I’m surprised. How many times have you made full crusted pie, and there’s always a bubbly leak. They came out perfect! When you think about the simple ingredients and prep for these, the flavor is incredible. They’re quite large for one serving, but we didn’t have any trouble resisting eating our own. They keep well in the fridge and can be heated in the microwave for lunch the next day, drawing attention from anyone within smelling distance. 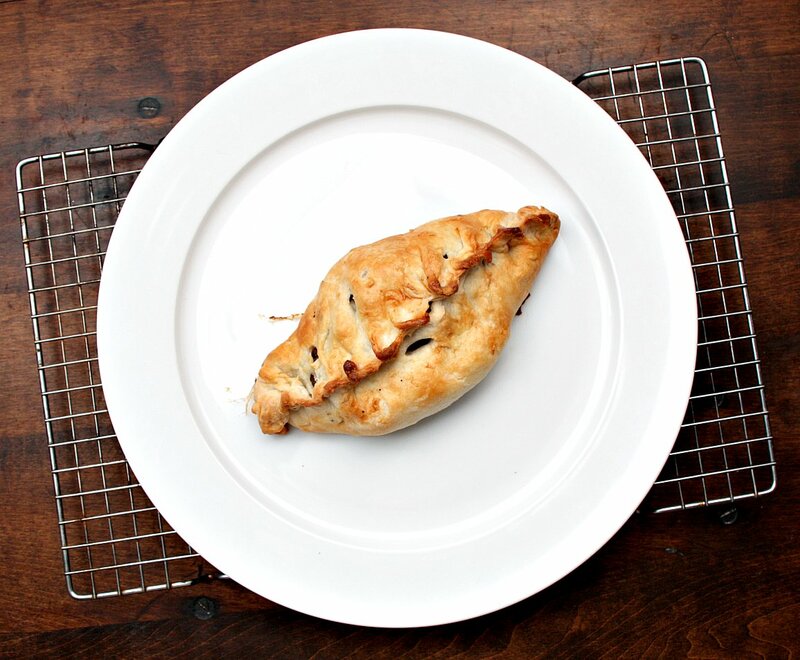 Evidently, original Cornish pasties had a bit of both sweet and savory in them, with the sweet part keeping to one side of the filling. They’re traditionally eaten by hand using the crust as a sort of handle, which according to one source, used to be thrown out. It had something to do with coal miners and impurities in the air or something like that. Although I will admit the leeks, cheese, and thyme are not authentic, I completely avoided putting in carrots which I understand is a seriously big deal. Who knew? I think the possibilities are endless when it comes to fillings. Sweet potatoes, pumpkin, squash, apples, nuts….Just give me some time. There’s a pasty shop very near to the old inn where we’re staying in Canterbury, so I’ll have to let you know what the comparison is. 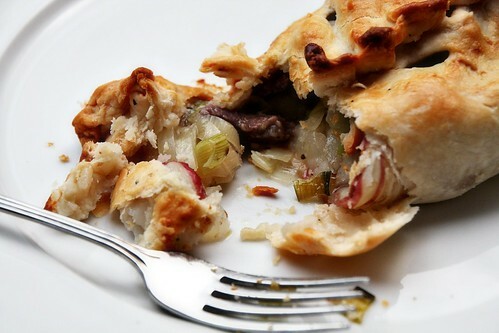 In the meantime, make a pasty and let me know how your version turns out.